Some of America’s most protected corals have been blighted by bleaching, with scientists warning that US reefs are on course to largely disappear within just a few decades because of global warming. 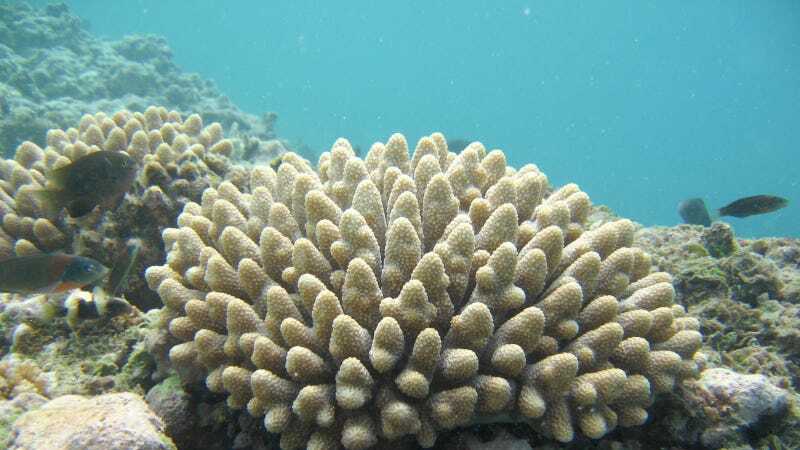 New research has shown that strict conservation measures in Hawaii have not spared corals from a warming ocean in one of its most prized bays, with the National Oceanic and Atmospheric Administration predicting yet more bleaching is likely off Hawaii and Florida this summer. “I’m concerned because we could very well see bleaching return to Florida, parts of the Caribbean and Hawaii,” said Mark Eakin, a coral reef specialist at Noaa. A global coral bleaching event has shifted between the northern and southern hemispheres since 2014, affecting around 70% of the world’s reefs. The “terminal” condition of Australia’s sprawling Great Barrier Reef, which suffered bleaching along two-thirds of its 1,400-mile length in 2016 and 2017, has provoked the greatest alarm. But scientists have pointed out that America’s main reefs, found off Hawaii, Florida, Guam and Puerto Rico, are facing a largely unheralded disaster. Bleaching occurs when prolonged high temperatures in the ocean cause coral to expel the symbiotic algae that provides it with food and colour. The coral turns a ghostly white, and can die if tolerable conditions don’t return. The world’s oceans have absorbed more than 90% of the extra heat generated by the release of greenhouse gases from human activity. Cobb said regular annual bleaching events, which recent research has forecast happening by the 2040s, will “undercut the resilience of these ecosystems”. Corals not killed off by bleaching are left weakened by the process and are less likely to survive if repeatedly subjected to above-average temperatures. In 2014 and 2015, Hawaii’s coral reefs suffered up to 90% bleaching, with some areas losing half of their coral cover. New research now shows that even one of the most protected parts of the Hawaiian coast was ravaged by coral bleaching. Surveys of the Hanauma Bay nature preserve, a protected enclave on Oahu where fishing is banned, found 47% of the area’s corals experienced bleaching on average, with nearly 10% dying. Hanauma Bay is popular with tourists, with around 3,000 visitors each day, but the research stressed that the heat of the ocean rather than direct human interference caused the coral loss. In 2014, Hawaii experienced only its second recorded episode of widespread bleaching, with around 90% of the shallow reefs affected at Lisianski Island, part of the vast Papahānaumokuākea marine national monument. Eakin said this bleaching resulted in “kilometers of reef that was completely dead” and showed that the absence of local pollution or tourism cannot compensate the impact of warming waters. Elevated heat, spurred by a El Niño climatic event, returned in 2015 and led to bleaching along the shores of Hawaii island and Oahu, the first back-to-back bleaching seen in Hawaii. The situation could have been more severe had storms not brought relieving cloud cover to areas including Hanauma Bay. Last year, scientists highlighted the “unprecedented” collapse of Florida’s reef, which curves along the south-eastern tip of the state to the Florida Keys. The ecosystem, the only barrier reef in the continental US, was pillaged by bleaching in 2014 and 2015 and is now “beginning to dissolve away”, according to Chris Langdon, a coral expert at the University of Miami. Despite the onset of La Niña, a flip-side of El Niño that results in an upwelling of cooler waters at the tropics, the global bleaching event continues unabated and is the “longest, most widespread and most damaging on record”, according to Noaa. Severe bleaching has swept across the Pacific Ocean, Indian Ocean and the Caribbean, with some areas altered beyond recognition. More than 80% of shallow water reefs off Christmas Island, an Australian territory in the Indian Ocean, have died, while images released from a survey last year showed 90% bleaching of reefs around Okinawa, Japan. Coral reefs are found in less than 1% of the world’s oceans but support a riot of colour and life, with around a quarter of all marine species relying upon the nooks and crannies of reefs for food or shelter. Reefs also act as a crucial coastal buffer from storms and provide food and livelihoods for millions of people. A study published this month found the global reef tourism industry is worth around $36bn. “In the US our reefs are worth a huge amount but I don’t know if people realize that, more attention would not hurt,” said Dona, co-author of the Hawaii reef study. This story was originally published by The Guardian and is reproduced here as part of Climate Desk. Environment reporter at Guardian US.